Update, March 15: Geralt will feature in Soul Calibur VI. 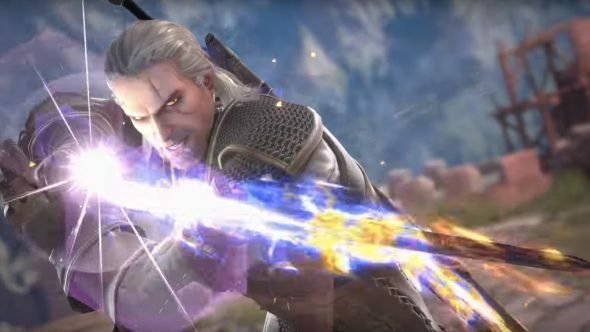 Geralt of Rivia will appear as a playable character in Soul Calibur VI. After several teases from CD Projekt Red staff and the official Witcher twitter account, the new character was announced this afternoon. Imagine a Witcher 4 without Geralt. Well, don’t imagine it – read our article about why Ciri should lead the series from now on. We are excited to announce that Geralt of Rivia will be joining the playable characters roster of Bandai Namco’s @soulcalibur VI, with Kaer Morhen as a new stage! There’s also a video documenting both the new Kaer Morhen stage, and Geralt himself. The hero of The Witcher trilogy is featured rising from his meditation pose, and drawing one of his two swords from his back, before going to town on some of the rest of the Soul Calibur roster with sword and sign – Igni, Quen, and Axii all feature. The news will undoubtedly come as a disappointment to some – myself included – who were hoping the multiple teases in the run up to this announcement would result in something new from CD Projekt Red, but at least we’ll get another chance to see the White Wolf in action. Soul Calibur VI is due for release in 2018. Original story, March 6:Earlier today, CD Projekt Red’s community lead Marcin Momot put up a little tease on Twitter, hinting that Geralt could be coming to another game series. Monster Hunter: World is coming to PC. Geralt is a monster hunter. Must be that, right? You have never been so wrong in your life, buddy. Monster Hunter: World on PS4 had tie-in content for both Street Fighter and Horizon: Zero Dawn, so we will let you off for assuming this was it. Of course, we would never wrongly assume anything ourselves, which is good, because apparently Geralt’s off to batter Mitsurugi in Soulcalibur VI. LPVG were tipped off a little while back by a reader of the site, but they didn’t report on it at the time because they could not back it up. Momot’s tweet all but confirms it, however. It makes perfect sense when you think about it. Soulcalibur is a series renowned for guest appearances, from comic character Spawn to space Nazi Darth Vader. Everyone’s at it, and now Geralt is as well. Hopefully there’s some coin in it for him. On top of that, Soulcalibur publishers Namco Bandai also published The Witcher 3 over here. They’ve clearly been conspiring together to make something work.